It’s Thursday afternoon and therefore it’s time for another new Toy Story 3 character to be released! We’ve already had Ken, Peas in a Pod and Hog-O’-Lot Bear and today it’s Buttercup, a lovely lady Unicorn! You can click the image below to enlarge or the one above to see all the other character that have already been released. Toy Story 3 is released July 23rd, is directed by Lee Unkrich and has voices from Tom Hanks, Tim Allen, Joan Cusack, Don Rickles, Wallace Shawn, John Ratzenberger, Estelle Harris, John Morris, Laurie Metcalf, R. Lee Ermey, Jodi Benson, Ned Beatty, Bonnie Hunt, Timothy Dalton, Jeff Garlin, Whoopi Goldberg and Michael Keaton. Saddle up for fun and let Buttercup lead your child away on a magical adventure! 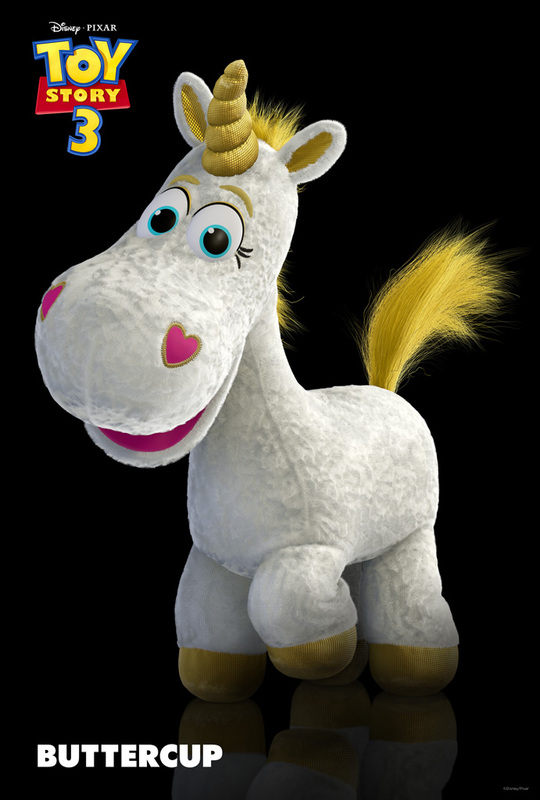 This cuddly unicorn features velvety-soft, snow-colored fur with sparkly gold and pink accents. He sports a signature mythical golden horn and a fun-to-comb mane and tail. Buttercup’s durable plastic eyes are both charming and scratch-resistant. Hypo-allergenic. Ages 3 and up.